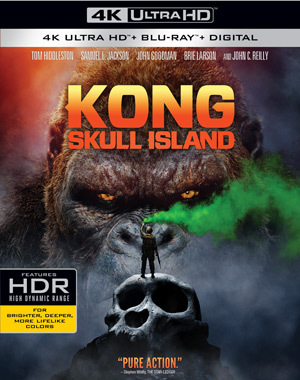 Warner Brothers Home Entertainment has just unleashed a pack of information on us, indicating that the studios will release Kong: Skull Island on 4K UHD, Blu-Ray Disc and DVD in July. This compelling, original adventure tells the story of a diverse team of scientists, soldiers, and adventurers uniting to explore a mythical, uncharted island in the Pacific, as dangerous as it is beautiful. Cut off from everything they know, the team ventures into the domain of the mighty Kong, igniting the ultimate battle between man and nature. As their mission of discovery becomes one of survival, they must fight to escape a primal Eden in which humanity does not belong. The movie stars Tom Hiddleston, Oscar® nominee Samuel L. Jackson, John Goodman, Oscar winner Brie Larson and Oscar nominee John C. Reilly, among others. The release will come with a Commentary Track with director Jordan Vogt-Roberts, as well as the Featurettes Creating a King: Realizing an Icon and Creating a King: Summoning a God. Also included are the Monarch Files 2.0 and a look at Tom Hiddleston: The Intrepid Traveler. Through the Lens: Brie Larson’s Photography will also be included on the release, as well as a Location Featurette highlighting the shoot in Vietnam. The release is rounded out by a selection of Deleted Scenes. Kong: Skull Island will be available on July 18 with a sticker price of $44.95 for the Ultra HD Blu-ray Combo Pack, $44.95 for the Blu-Ray 3D Combo Pack, $35.99 for the Blu-Ray Combo Pack and $28.98 for the DVD version.